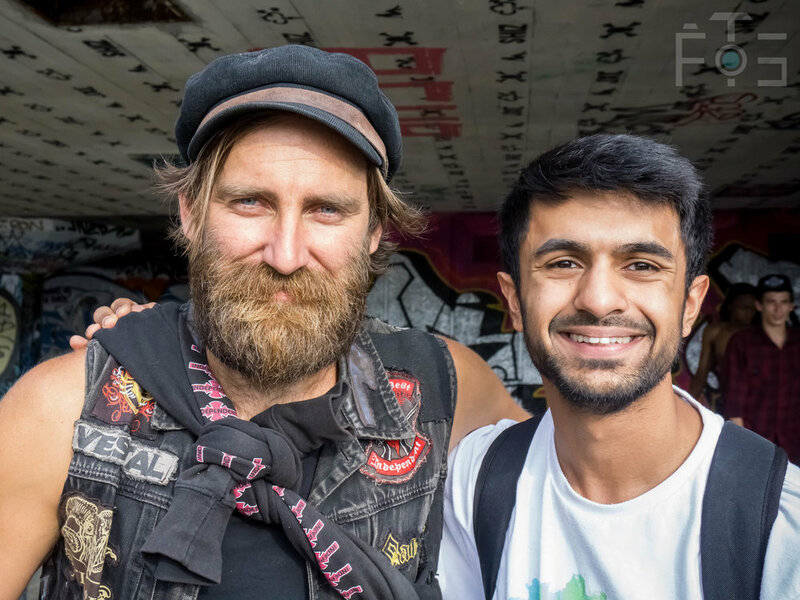 The Globe skate team announced a tour around Europe's biggest cities for the month of July, stopping by London, Berlin, Brussels, Wevelgem, Lyon, and Barcelona. The team includes the likes of Anton Myhrvold, Philipp Schuster, Fries Taillieu, Charles Collet, Mark Appleyard, David Gonzalez, Rodney Mullen, Louie Barletta, Ryan Decenzo, Chris Haslam, and Paul Hart, and meeting these guys was too good of an opportunity for me to miss. Allow me to explain why. From the age of 12, I found myself religiously playing Tony Hawk's Pro Skater 3 (THPS 3) on my PlayStation 1. When you finish career mode with a skateboarder, you get a little feature clip of them skateboarding in real life. Rodney Mullen's video part stood out from all the others. His skating style was so different to the others that it blew my mind. After re-watching his clip several times, I felt inspired to learn more about Mullen, and discovered that created the flatground Ollie, Kickflip, Tre Flip, and almost every other flip trick you see on the streets (and in THPS 3) today. In short, Mullen founded street skating, and made it into the community it is today. Mesmerised at his skateboarding, I felt moved to try it for myself, and it was there where I began to become a skateboarder. Over the years, I learnt various tricks and met fantastic people through skateboarding, which shaped me as a person and helped me build up my confidence and positivity towards life. In a nutshell, skateboarding changed me and made me a better, happier man, and I owe it all to Mullen. It became my dream to meet Rodney Mullen, take his photograph, shake his hand and thank him for what he has indirectly done for me, and the skateboarding community. However due to me living in London and Mullen being a professional skateboarder in the States, the chances of that happening were second to none... or so I thought. On the 4th July 2015, my impossible dream became true. I was finally able to do it after eight long years. To look Rodney Mullen in the eye, personally thank him for what he has done with skateboarding, and to see him smile, I will never forget that. He embraced my words, and was so grateful, and that meant a lot to me. It was by far the happiest I have been in life for a while. Thank you Globe Europe for the tour, and for this wonderful opportunity. Additionally, whilst researching upon Mullen, I also came to discover another iconic skateboarder that was Chris Haslam. Haslam's skateboarding was another that impressed me, for he seems to have the deepest bag of tricks in which I have ever seen. Meeting him, shaking his hand, skating with him, it all felt so surreal. I spent almost my entire time there talking to him about his video part in Almost Round 3, his winning entry in Berrics 2UP, what it's like skating with Rodney Mullen, how to Laser Flip, and more. I even gave him my business card! Here are all of the edits that I collected on that day. 1/200 secs, f7.1, ISO 3200. Mark Appleyard and Philipp Schuster. 1/200 secs, f7.1, ISO 3200. 1/320 secs, f7.1, ISO 3200. Chris Haslam and myself. 1/500 secs, f7.1, ISO 2000. Myself and Rodney Mullen. 1/125 secs, f7.1, ISO 2000. Rodney Mullen signing my board. 1/125 secs, f7.1, ISO 2000. Rodney Mullen's and Chris Haslam's autographs on my board. 10 secs, f16.0, ISO 100. Thank you once again for everything Rodney. 1/200 secs, f7.1, ISO 2000.